﻿ Our captain and hostess were the most special people of all... - Sail In Ionio, Sailing in Lefkada. Best prices in Lefkada island. My wife Tammy and I were looking for a beautiful and unforgettable experience for our honeymoon. Sail in Ionio not only provided this, but exceeded all our expectations by becoming our gateway to a new world of heavenly beauty, loving people, and exhilarating new skills. Our Captain Nikos and our hostess Lesley became the consummate ambassadors and traveling companions in a unique journey that has changed our lives forever! For two weeks we sailed over 200 nm in the beautiful sloop Bebela, visiting fourteen gorgeous destinations across seven Ionian Islands. The experiences we had were as unique and special as each of those island jewels. Our captain and hostess were the most special people of all. With over thirty years of sailing experience, Capt Nikos’ expert assessment of the daily weather conditions, coupled with his rich and detailed knowledge of all the islands, allowed him to select the best ports of call for our care-free relaxation. Without fail, he knew where and when to arrive daily to provide us with the maximum enjoyment and the best access to local villages and tavernas. On many occasions, we had the best anchorage spot and would watch as other less experienced crews had to settle for less than ideal locations. Our hostess Lesley is gifted with an uncanny ability to anticipate her guest’s every need, providing everything from necessities (like fresh towels and blankets) to every form of treat imaginable. She loves to hike and provided her expert advice of beautiful trails on every island. But her greatest gift is her love for cooking, which was superbly displayed with every lovingly prepared breakfast and lunch she created for us. She carefully listened to our desires and crafted delicious meals catering to our individual tastes. Thank you Capt Nikos, Lesley for enriching our lives and giving us new dreams. We will never forget this experience and look forward to sailing with you again many times in the years to come! 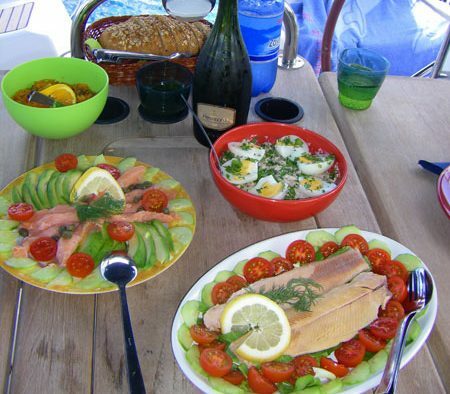 The sample menus below will give you a taste of the style of meals we serve when on board our yachts.